Dawn Hudson, former CEO and president of Pepsi-Cola North America, merged two of her passions, marketing and sports, when she became chief marketing officer of the National Football League in 2014. The NFL has had its challenges, from new evidence about player brain damage to Deflategate. But Hudson maintains the image of what remains the most popular sport in America. 01. What are you reading? 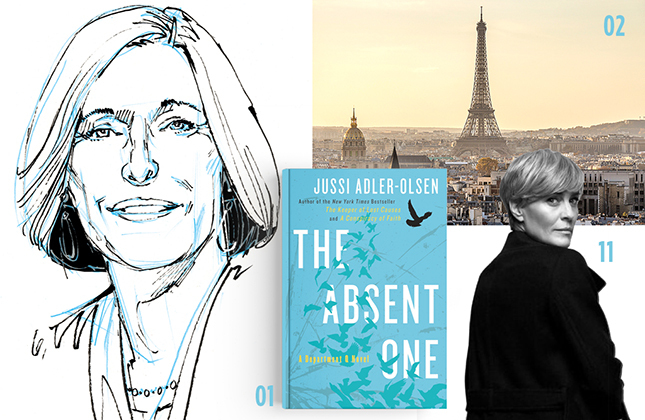 The Absent One by Jussi Adler-Olsen. 02. Your favorite city? I love Paris—visually, walking around, the smell, the melting pot of people. And New York. I get a bolt of energy in New York. 03. How much do you travel? Probably a third of my time. 04. Do you have time for leisure travel? I’m a believer in work hard, play hard. People can’t keep going, contributing, thinking, if they don’t take time for themselves. 05. Top vacation spot? Skiing in Colorado, but I like to balance that with going to a Caribbean island and going to Europe. 06. What’s your investment philosophy? Long-term and growth stocks. I look at things from an idea basis, from a growth basis, and I give them time to make it happen. 07. Who’s your biggest business influence? Steve Reinemund and Roger Enrico, both CEOs of PepsiCo. Steve came up through food service and selling, and I learned so much from him. And Roger was a marketer, who taught me the power of a big idea executed well. 08. What’s the best part of your job? Being on the football field before kickoff. The players are warming up, and you realize how amazingly athletic they are. There’s a palpable excitement. There’s a pulse to it. 09. Biggest challenge? Growing a brand that connects with over two-thirds of Americans, and realizing you can’t please everyone. You just must stay true to what the sport’s about. 10. Favorite movie? The French film The Intouchables and Deadpool. 11. Favorite TV show? Good Morning Football and House of Cards. 12. Favorite restaurant? I don’t necessarily have a favorite restaurant, but it would be something French. 13. Your watch? I love watches. I have about 20. I’m looking forward to the new Apple watch because I love the idea that I don’t have to carry my phone. 14. Most-loved accessory? A scarf by Etro. It’s cream, blue, purple and pink, and it goes with everything. 15. Favorite outfit? J Brand jeans and a fitted NFL sweatshirt by Nike that’s pink and gray. It’s really soft and comfortable. 16. What keeps you up at night? Very little. When I get to bed, I sleep. 17. The biggest challenge you’ve had to overcome? My daughters are 27 and 19, and they’ve had their issues. It’s not when they’re 18 months old, but when they’re adults and you can’t fix it for them. That’s hard. 18. Favorite philanthropy? I give to Dartmouth, my alma mater, because it helped me at a formative time in my life. Also, my oldest daughter is bipolar, and I contribute to Project 375, a mental health advocacy organization started by New York Giants wide receiver Brandon Marshall. 19. The best advice you ever received? Roger Enrico, when he was chairman of PepsiCo and I was considering joining, said to me: “Think about who you want to hang out with.” Meaning really consider the character and quality of the people who also work in the organization. 20. What have you learned about power? Power is best utilized if it is distributed. Share your power. Use your power to motivate and stimulate others; the power of that is so much stronger than any individual’s power.